Craig Barrett, leader after the challenging Cross Country phase of the HSBC FEI Classics™ in Adelaide, and riding in his first 4* competition, said he was both “absolutely thrilled” and “disappointed” after today’s action: “Sandhills Brillaire went beautifully and galloped really well, but with Wendela Jamie (Dressage leader), I just made too many mistakes”. Shane Rose, who put in a faultless performance to lead the CCI2*, struck trouble early on the 4* track with a runout at 5B riding APH Moritz. A further stop at the Advertiser Hedge saw Rose joining the six 4* competitors to walk home. Wayne Copping’s track was shortened by 30 seconds, with the Qantas Flyover taken out and the last fence situated close to the misting tents and cooling off area. The weather turned out not to be as severe as predicted, but with horse welfare paramount, the adjustment was applauded by all. Natalie Blundell from Harden in New South Wales was in contention for London 2012 Olympic Games selection, and with her talented horse Algebra, used her experience to produce only the second clear round over the fences. The pair added 5.6 time penalties and hold overnight second place with 59.80. Natalie won the first Adelaide 4* in 1999 riding Billy Bathgate and declared: “I hope to put pressure on Craig tomorrow”. Penalties were also spread around the course resulting in runouts. Apart from one rider fall, the faults came from failure to have the horse well enough in front of the leg and straight, resulting in harmless but costly penalties. Spectators flocked to the venue in their thousands, aiming for the shade afforded by the Adelaide Parklands. 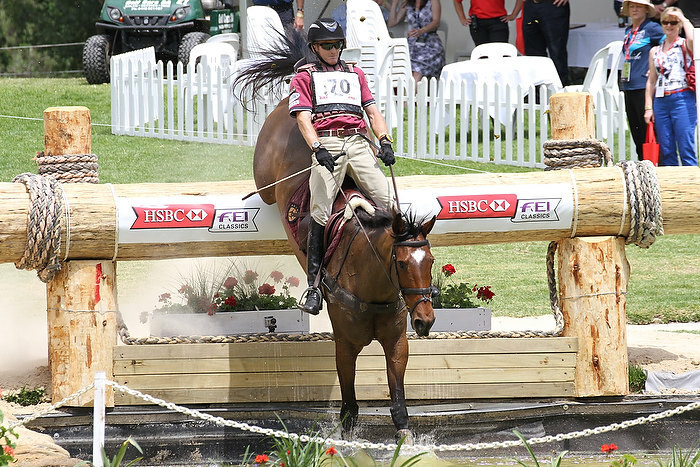 The event grows each year and, since it became part of the prestigious HSBC FEI Classics™ series, its profile has undoubtedly grown amongst Australian equestrian enthusiasts. Event Director Gill Rolton was pleased to comment that the Local South Australian Government and Adelaide City Council were both now fully behind the event. “Running this event is a huge commitment, but we need an event of this stature in this country,” she said. The final Jumping phase will be staged tomorrow, with Barrett aiming not only to win the Adelaide leg of the HSBC FEI Classics™, but also claim the HSBC Bursary for the highest placed rider never to have previously completed a 4* event. 04:55 CET – 05:45 CET HSBC FEI Classics™ Jumping (*also available on Monday 26 November in the afternoon as Video-On-Demand).